This is the introduction to my book How to Win Your NCAA Tournament Pool. To get the book, click here. You want to win your March Madness pool. You know the obvious benefits of winning. Money. Ego. Bragging rights for the year. But perhaps you crave something more, like the thrill of finishing ahead of the office loudmouth, Bob. This lunatic thinks he’s skilled at Super Bowl squares even though the numbers get assigned at random (he’s won the last two years). You’d like to smack him for his ridiculousness, but office propriety forbids it. The March Madness pool gives you an opportunity to get back at Bob, but it seems so hard to win. Even the most dedicated fan doesn’t have the time to follow the sixty-some teams that make the tourney. This makes it nearly impossible to predict early round upsets. However, there’s a better way to win your March Madness pool than picking upsets at random in the early rounds. 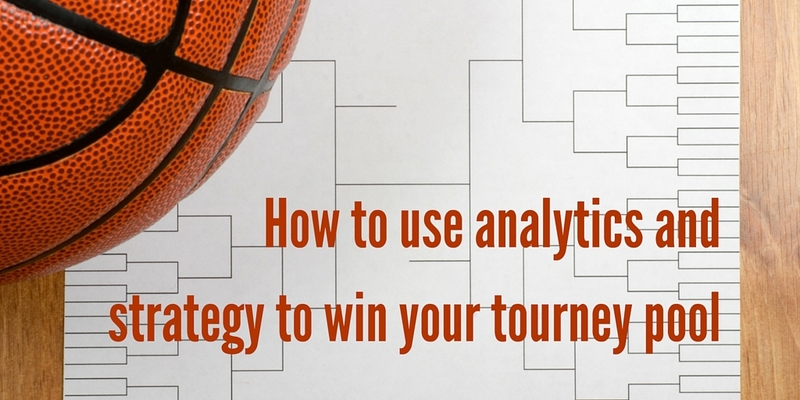 This book offers an analytics and strategy driven approach to winning your March Madness pool. Analytics provides a means to make more accurate predictions than others in your pool. Strategy will let you exploit the biases of others to increase your odds of winning. The research in this book looks at how this approach has performed over a multitude of past tournaments. This journey reveals the hidden truth behind the optimal way to fill out your bracket. Duke won the tourney, and Ryan didn’t hear a peep out of Bob for a month, enjoying the glorious silence. Let’s look at the two primary ingredients for winning your pool. It’s difficult to predict the outcome of tournament games. First, college basketball gives us a limited number of games each year to evaluate teams. In addition, the differing strength of schedules make this lack of data even worse. For example, Duke plays a much more difficult schedule than Stephen F. Austin. Second, randomness plays a huge role in the outcome of basketball games. College basketball features the grace and stupidity of hormonal males with an average age around 20. Throw in the randomness of a bouncing basketball, particularly on three point shots, and you get upsets like Mercer over Duke in the Round of 64. It’s not possible to overcome the randomness of college basketball. In fact, it will help us win pools (more on that in the next section). But analytics can help with the lack of data and differing strength of schedule. Let me explain. In 2008, I was reading a paper on Google’s PageRank technology. This algorithm brought order and insight to the complex world of web search. The basic idea was that a website was important if another important website linked to it. I quickly realized that this applied to sports. Teams are webpages, and games are links between the teams. In sports, teams earn credibility for beating other good teams. The direct application of PageRank doesn’t lead to good tournament predictions. However, I took the core ideas and applied my Ph.D. research at Stanford to develop a new method for ranking teams. These developments allowed me to use margin of victory in games instead of wins and losses as the primary input. When I first developed this method, I did some NFL predictions and sent an email to some friends. Their encouragement prompted me to look at other sports, including college basketball. Implementing college basketball was a challenge, as I had to teach my computer how to solve 351 equations simultaneously for 351 variables, one for each team. However, the results were worth it. You’ll be glad to know that I have been and continue to be in first place in my family bracket, and yesterday the message board was abuzz with talk of my first 8 picks being perfect. My police officer cousin threatened to subpoena my IP address to make sure I had picked before the games started. I explained my picks and posted a link to The Power Rank website, which prompted my uncle to cry foul about my research methods! For the 2002 through 2015 tournaments, I’ve tested how my pre-tourney predictions fared in over 900 games. The team favored by my numbers has won 71.4% of games (650-261). Using analytics for your bracket is much like counting cards in blackjack. In this popular casino game, the odds of winning a hand depend on which cards remain in the deck. By keeping track of dealt cards, people like Jeff Ma, an analytics guru and the inspiration behind the movie 21, made money off the casinos. Did Jeff win every hand in blackjack? No. Did he win every time the deck gave him the best chance of winning, like doubling down on 11? No way. However, Jeff won enough that he’s no longer welcome to play blackjack in Las Vegas. In the same way, analytics will not predict every tournament game. Again, numbers can’t overcome the inherent randomness in college basketball. But analytics gives you the best chance to get ahead of the competition. However, an accurate predictor of games isn’t enough to win every pool. You need the right strategy, and here’s why. In 2015, Kentucky came roaring into the tournament with an undefeated record. Coach John Calipari has embraced the one and done era of college basketball in which the best players leave for the NBA after a year. Each season, he deals with a new freshman class of talented but untested players. However, the 2014-15 season was different for Calipari. Some of his best players from a Final Four team the previous year, like Aaron Harrison and Willie Cauley-Stein, stayed around for another year. Along with this typical stellar recruiting class, Kentucky fielded a deep and experienced team. Kentucky’s dominance and undefeated record inevitably led to a bias among bracket pickers. More people picked Kentucky to win than the numbers merited. And you can exploit this bias to increase your odds of winning your pool. But first, assume you pick Kentucky as champion in a big pool. My numbers suggested this choice by a wide margin over other teams. The problem is that many others in your pool also pick Kentucky as champion. If the Wildcats win, you and many others get the 32 points. However, with so many others getting these points, there’s a strong chance that one of them gets lucky with low probability upsets in the earlier rounds and beats you. If the top half of the pool entrants split the pot equally, then Kentucky would be a stellar choice for champion. Your solid picks using analytics in the earlier rounds would almost certainly put you in the money. However, most pools do not work like this. Only the top bracket (or maybe three) win prize money. To win this type of pool, you need a contrarian strategy. You need to pick a champion with a decent win probability but who is not getting picked as champion in many pools. It worked for Randy Athay from Lake Havasu City, Arizona, who read the first edition of this book in 2015. I played 2 contrarians (Arizona & Duke) in a middle size pool. I used your advice in picking the games (rather than waste time looking for sleepers etc.). Going into tonight, I would take 1st with a Duke win or take 3rd with a loss. I was fortunate to win the bigger pot. Much appreciated. Duke won the tourney in 2015. To understand this contrarian strategy further, consider daily fantasy football. Each week, contestants pick a lineup of players and score points based on statistics like touchdowns and yards gained. In 50-50 leagues, the top half of participants split the pot equally. In these contests, it makes sense to pick players expected to score a large number of points. For example, you might pick a pre-2015 Peyton Manning as your quarterback. It’s similar to picking Kentucky to win the tourney in 2015. Daily fantasy also offers Guaranteed Prize Pools, contests with thousands of players hoping to win a bigger prize. Only a small fraction of players win money. In these massive contests, a contrarian approach makes sense. In all likelihood, many others in the pool own Peyton Manning. Contrarian thinking implies finding a quarterback that not as many people own but still has a decent chance of scoring a lot of points, like Matt Stafford. In daily fantasy sports, it’s difficult to apply this contrarian strategy. Predicting player performance is hard, and you often have to guess what fraction of pool participants pick a particular player. Neither of these problems applies to March Madness pools. In the next chapter, I’ll show you how analytics can predict tourney win probabilities with reasonable accuracy over a wide range of years. In addition, ESPN publishes data on how many people pick a particular team to win a game. With millions of pool participants, it gives us good statistics on public behavior. This book uses this analytics and public data to provide reliable estimates of how contrarian strategies perform. In all honesty, this book might not be for you. You’ll be asked to bend your mind and believe ideas that aren’t intuitively obvious, like picking a champion in your pool that doesn’t have the best chance of winning the tourney. I’ll support these claims with research based on cold, hard data. However, believing in these results also requires a nimbleness of thought. I’m asking you to believe that if the 2015 tournament happened again, Kentucky would win (even though they didn’t win the actual tourney). In fact, they would win more of these simulated tourneys than any other team. It’s not easy for someone new to sports analytics to believe the research in this book. It’s much easier to think you know who’s going to win the tourney, then search the internet for which 12 seeds to pick in the first round (the latter is a huge waste of time). But it helps if you’ve read books like Moneyball and Freakonomics and buy the idea that data can reveal hidden truths. This book will reveal these truths about winning your NCAA tournament pool. It’s a reference book for the smart bracket picker, something to grab every year for a refresher. You won’t win your pool every year. But if you apply the ideas in picking your bracket every year, you’ll end up way ahead of loudmouth Bob, king of Super Bowl squares. Thanks for reading. To get the book or audiobook (or both), click here.